Sailing brings some of my greatest memories. Fresh air, sound of water splashing on the boat. Breath taking sunsets. Great adventure: struggling with the powers of nature - wind and water. Sailing can be truly amazing. I am glad you decided to get into it, you will pick up a hobby that can be with you for many years to come, who knows, maybe it will even become your way of life. Imagine, cruising around in the boat, with someone you love, visting exoctic places. Anytime you pick you a sophisticated hobby, like sailing, there is a fair amount of things to learn. You need to undergone a training to gain a basic competency in your new trade. Training, in particular sailing training will be our topic for tonight. I will briefly recap how we do training today and show you a better way that will be available to you very soon. How does sailing training work nowadays? First of wall, you have a practical sessions on the water. They are very important, you need as much of it as you can get and that’s where the actual sailing take place. Then there is theory class, usually in the form of the briefing just before going on the water. Instructor explains a bit of theory and there is your chance for interactive Q&A. Last but not you have your learning at home - you can go through books or online videos and cover any relevant theory at your own peace. The challenge with the initial training process is that there is so much to learn. 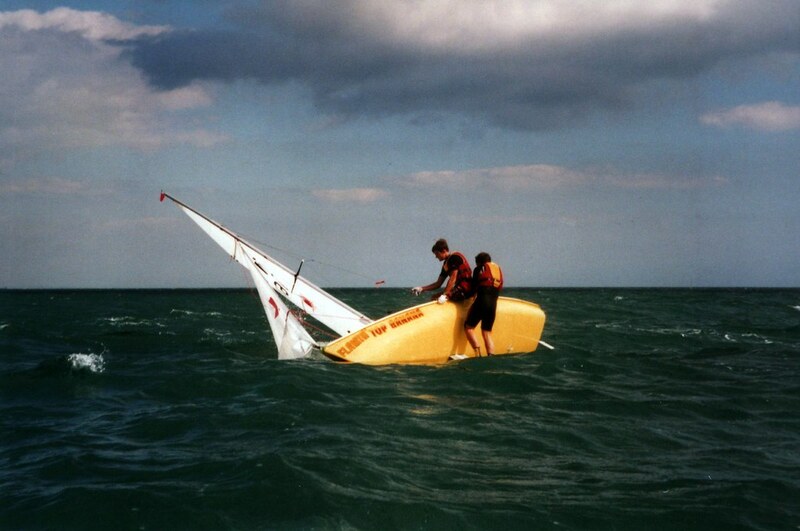 On the water, the weather condition, something we can’t control have to be just right for the beginner, otherwise sailing is just too much overwhelming and potentially dangerous. Myself and Olga, we started doing a sailing class a few weeks ago. Our first week, wind was to strong and we didn’t get to steer the boat on our own. Following week, we got to sail.. but one of other boats capsized due to a strong wind. In a situation like this, you wish for something like a slow motion, a famous matrix bullet time, where you can pause reality and analyze situation at hand. This unfortunately is impossible in the real life. What is the issues with classroom training? Usually it’s conducted in a group with an aid of a whiteboard. Whiteboards are 2 dimensional, actual world has 3 dimensions. Sometimes this translation is confusing to students. Moreover, in a group sometimes we don’t get to slow down and focus on something only we need to work on, as the group needs to move on. Finally books and videos - they suffer from non interactivity and we are looking at 2d representation on the real world again. There is a new kid on the block and it can complement methods I’ve just mentioned and make your sailing training smoother. It has strengths, where other methods have weaknesses. Virtual Reality - available now in a form of Google Cardboard. For those of you unfamiliar with the concept. Take 2 lenses, a piece of cardboard to make a case, slide in your phone and you have a magic device that will plug you into matrix. Virtual reality is all good and nice, but we need a training content. Let me introduce you to a project I’ve been working on - MarineVesre - sailing and virtual reality. I am working on an app that will teach you how to sail, or at least help in the process ;) And don’t just take my word for it - I’ve showed it to a few sailing instructors and they love the potential of it. Virtual reality is like magic, it is like lucid dreaming. Imagine, interactive, 3D, 360 world around you. With a click of the button you can slow down time. No longer being confused with what’s going on with the boat or what is the wind direction. Just press the button and look around. No more boring books, enter a virtual world as a pirate and explore the ship. Take quizzes and swim with sharks if you get a quizz wrong. Enjoy fully immersive easy to grasp visualizations of theoretical concepts and develop intuition for sailing. Join our training revolution and recap benefits of accelerated learning. Go online and purchase a very affordable, may I say cheap Google Cardboad. This is a boat that will take you into a world of virtual reality. Once you have it, install MarineVerse app and get underway to become a sailor of your dreams.